Rendering of the future Abington Senior High School, with the Stephen A. Schwarzman Center for Science and Technology pictured in the foreground. 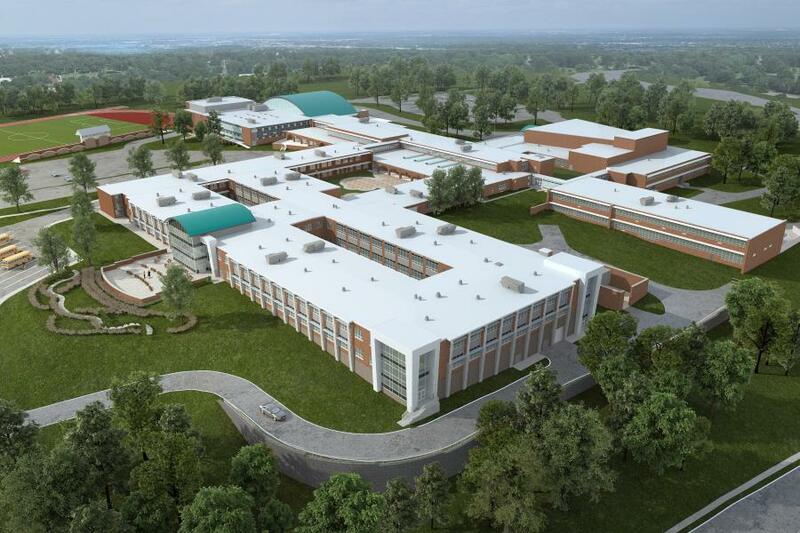 The Board of School Directors of the Abington School District announced the groundbreaking for its more-than-$104 million Abington Senior High School additions and renovations project, including the Stephen A. Schwarzman Center for Science and Technology. The official groundbreaking was held Nov. 2, 2018 on the site of the future wing — along the Ghost Road entrance — for which alumnus Stephen A. Schwarzman generously donated $25 million in an effort to help inspire a new generation of future-ready learners. With an anticipated opening in the fall of 2020, the new science and technology center includes science, art and general classroom space. Other additions throughout the school building involve the construction of an auxiliary gymnasium, career center and a new cafeteria. Ninety-three percent of the existing facility also will be renovated, with an estimated completion date of 2022. "After years of planning and design, the Board of School Directors and I are very much looking forward to breaking ground on what will be the biggest project the District has embarked on in the 21st century," said Raymond McGarry, Board president. "With Abington School District seeing an enrollment growth of more than 10 percent in the past decade — by approximately more than 100 students each year — it became evident that we needed to find a practical and economical solution for our community. We are pleased to be able to bring this project to fruition, which will benefit every student for generations to come." This will be the first major addition and renovation to the original 1956 Abington Senior High School building in nearly two decades. Currently, Abington Senior High houses grades 10 to 12, but the expansion is designed to allow for the accommodation of grade 9, which presently is housed at Abington Junior High School, located on the same campus. As a result, 6th-graders will be moved from their respective seven elementary schools to the Junior High building, which upon completion of the project, will be home to grades 6 to 8 in a middle school configuration. These planned reconfigured grade spans have helped pave the way for a reimagined curriculum, for which a Superintendent's Committee has been formed in order to help shape new, innovative programming focused on the skills needed to compete in the evolving workforce and prepare students for the nation's fastest-growing industries and jobs of the future. The Committee is comprised of administrators, teachers, students and community members to inform best practices for implementing these changes. Additionally, the new curriculum will provide high school students more flexibility to choose classes across a range of subjects and specialties, providing greater exposure to a variety of industries and career fields. Complementing these changes, Abington Senior High School also will expand school counseling services so that children have the opportunity to explore their career interests earlier in life, with the goal of looking beyond just degree attainment. Established in 1888, Abington School District is a public school system located outside of Philadelphia in the suburbs of Montgomery County, Pa. With more than 8,300 students from Abington Township and the Borough of Rockledge, the District has seven elementary schools, one junior high school and one senior high school. For more information, visit Abington.k12.pa.us.